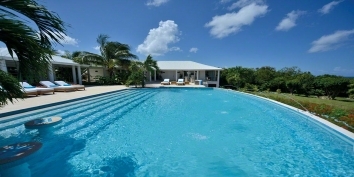 A contemporary, state-of-the-art villa with 4 bedroom suites, infinity edge swimming pool and magnificent views! Akasha is a contemporary villa with state-of-the-art amenities, but built to take full advantage of the outstanding natural beauty of Saint Lucia. This luxury holiday villa sits on a hillside in the exclusive Cap Estate, St. Lucia, overlooking the Caribbean Sea with views down to the world heritage site of the Pitons and the Pigeon Island National Park. From this unrivalled location you can watch the sail boats and mega yachts as they head into Rodney Bay Marina and in the evening enjoy the stunning sunsets with a glass of wine. Akasha has 4 luxurious bedroom suites, 6.5 bathrooms, spacious living and dining areas, games room, nine seat cinema, infinity edge swimming pool and 4,000 square feet of terraces. You can relax on the entertainment level or by the infinity-edge swimming pool, catch a film in the private cinema, listen to music anywhere and everywhere, sip your champagne while sitting on the bar stool in the cooling pool, play the piano, have a BBQ and entertain your friends, gaze at the stars from the lookout, or just lie in bed and watch the ships sail by. Our onsite manager and concierge can organize and book your trips, recommend where to snorkel, dive, make restaurant or golf bookings and much more. Our locally renowned cook can also prepare local specialities to give you a true taste of St. Lucia during your vacation. The ultra modern design of Akasha Villa is set in lush gardens from which our gardener produces organic vegetables for your table. Akasha combines the very best of modern living with the relaxed and content lifestyle of the Caribbean. Every room in the villa boasts spectacular views with huge floor to ceiling windows to take full advantage of them. From the lookout at Akasha you can see both the Atlantic Ocean to the east and the Caribbean Sea to the west. This ultra luxurious Caribbean villa features a state of the art Lutron lighting system, and whole home Crestron music and video distribution. You can relax by the pool with your favourite sounds delivered right from your own iPod - we suggest you bring it with you! Alternatively, you can choose from thousands of tracks of different genres or internet radio from the music server. Listen to the same music in any of the rooms inside the house, the terraces by the pool or on the lookout level while enjoying the spectacular views. Enjoy the music and light up the atmosphere. Each flat-panel TV allows you to choose a movie 'on demand' from the extensive movie library or watch cable TV. Crestron panels located on each floor allow you to manage all the music, lighting, entertainment systems, security, air conditioning, fans and security gates. These can also be controlled via the remote controls found in each room. At night time choose a scene from the Lutron lighting system – there are blue LED lights to create a tranquil environment. Akasha has a magnificent infinity-edge swimming pool with 'rain arc' and hot tub. The spacious terraces are ideal for relaxing and enjoying the stunning views. There is also a dining terrace with granite table, which comfortably seats 8 people and an intimate dining nook. The open plan great room of Akasha includes the lounge, dining area and kitchen. The lounge is equipped with 50” plasma TV and surround sound with Orb speakers and Meridan sub-woofer. The Natuzzi leather seating helps to add to the luxurious experience. You can fold the 10 feet high glass doors , which lead onto the main terrace, to fully appreciate the views. The dining area has a large, glass dining table which comfortably seats 12 people. The blue, Italian, Scavolini kitchen matches the colour of the Caribbean Sea and creates a cool ambiance. The gourmet kitchen is equipped with two ovens, microwave, fridge, freezer and dishwasher. In the island unit there is an ice maker, wine cooler, an additional sink and also seating for six. The laundry room houses an additional fridge and freezer for storing extra items when entertaining guests. Our villa manager will undertake any light washing required. All the Akasha bedroom suites have views of the Caribbean Sea and Rodney Bay. Each bedroom is equipped with plasma TV, ceiling speakers and mood lighting. All of which can be controlled by a hand held remote. The master bedroom suite has a king size bed and an adjoining room, which can be used for additional accommodation. The master bathroom has a plasma TV, Jacuzzi with chromotherapy lights and a shower. The second bedroom suite has a queen size bed and en-suite bathroom with bathtub and double shower. The third bedroom suite has two twin beds, which can be combined to for a king size bed, and en-suite bathroom with bathtub and double shower. The fourth bedroom suite has a queen size bed and en-suite bathroom with bathtub and double shower. Akasha villa has an entertainment level with bar and piano. This Caribbean villa has a nine seat cinema, which was designed as a floating room to provide the ultimate sound experience, with 120 inch screen! There is also a games room. Please complete the following form to send your inquiry direct to the Property Owner. Alternatively, you can call the Property Owner on 1-800-480-0941 (USA/Canada Toll Free). When calling, please don’t forget to say that you found the villa on CARIBIQUE. The above rates include air conditioning, airport transfers and taxes. Extra guests US$ 150 per person/night. 50% deposit required to secure reservation and the balance plus damage deposit (US$ 3,500) 49 days prior to arrival. Check In: 4:00 pm (check with us for possible early arrival). Check Out: 11:00 am (check with us for possible late departure). From the beginning to the end our stay at Akasha was truly breathtaking. We were collected from the Airport by a taxi which was organised by the Owner before we arrived, although our flight had been delayed by 4 hours our driver Barbara was still ... Read morewaiting on our arrival. When we arrived at Akasha we were taken aback by the extraordinary beauty of the Villa, we were greeted by Fred, the onsite manager who showed us around the Villa and he had also arranged for some refreshments for us. The main bedroom suite which I stayed in had its own private balcony with amazing views, which was a great place to sit first thing in the mornings and also to watch the sunset in the evening. We stayed in a group of 8 people, there was always something to do as there are so many different amenities. The cinema room was a big hit with all of us, watching Gladiator was brilliant. The games room was a popular getaway for the boys whilst us girls enjoyed staying poolside with our cocktails. Other facilities including wifi throughout, a control system which is of a very high standard, it allows you to play your own music (or choose from the extensive library of music), in any area in the house which means not everyone has to listen to the same music at the same time or at the same volume. The control system also allows you to control the lighting throughout the house, the remote gates, the alarm and also the CCTV for the house. As the organiser of this holiday for our group, I found the Owner very helpful and he was always prompt at responding to my questions. The package was designed for our individual stay at Akasha. The Owner also gave some good guidance of what to do whilst we were in St Lucia. Fred was always on hand if we needed anything and helped organise any activities we wanted to do. The other staff members were also very friendly and accommodating. On our arrival from London, we were picked up from the airport by a lovely lady called Barbara - the taxi had been pre-arranged through Akasha which was really convenient. The moment our taxi pulled up to the Akasha villa my breath was taken away. Perched ... Read moreon the top of a hillside mountain, the pristine white villa stood out amongst the green backdrop. We were greeted by Fred (the villa manager) who had kindly arranged for some well needed refreshments for us, before giving us a grand tour of our accommodation for the week. The villa was incredibly spacious; there was plenty of room for our group of 8 to spread out. 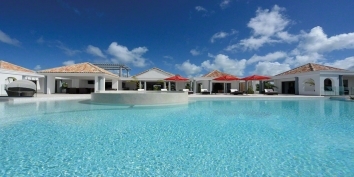 All bedrooms were large with fantastic views of the island and the bright blue Caribbean Sea. My bed was one of the most comfortable I’ve ever slept in, the bathroom was huge (the shower could have fitted in 3 people), and a balcony overlooking the pool. The infinity pool and hot tub were great; the water was warm with a stunning backdrop of the nearby beach and Pigeon Island. Watching the sunset in the evening from the hot tub was very impressive! Having a home cinema and games room in the villa was fantastic. It provided entertainment indoors for the times the sun got too hot outside. Other home comforts were WiFi, a sound system in each room, and a large sunken lounge area for relaxing time. 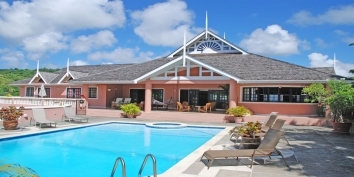 Akasha villa is close to the harbour and nearby town Rodney Bay. There are plenty of good restaurants to choose from, and the prices are very reasonable. Though we never felt the need to leave our peaceful haven, we did enjoy a day trip round the island, lunch by the stunning Piton Mountains, and also visited the Body Holiday resort which was within walking distance of the villa (albeit a very hilly walk! ).